A tutorial problem in stereoelectronic control. The Tiffeneau-Demjanov rearrangement as part of a prostaglandin synthesis. The roles of water in the hydrolysis of an acetal. In the previous post, I pondered how a substituent (X below) might act to slow down the hydrolysis of an acetal. Here I extend that by probing the role of water molecules in the mechanism of acetal hydrolysis. n waters in total participate in a proton transfer relay, in which a proton from the acid used to protonate one oxygen in the acetal is counterbalanced by another removed by a cooperating water. m waters serve as a stabilizer via hydrogen bonding. Water can also be modelled as a continuum dielectric solvent. My previous model included just one explicit water molecule (n=1) participating in 1 and 2 above (but not via 3) + the continuum model 4; the objective then being to study variation in X. I noted that the resulting barriers to reaction were too high for a facile thermal reaction; the model had to be incomplete. 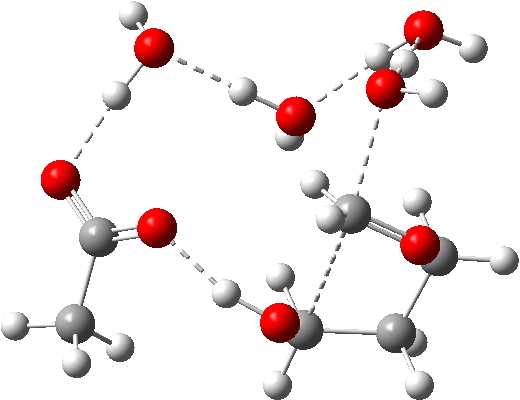 Here the objective is to probe the consequences of various deployments of up to four water molecules in this mechanism (X=R=H) to see if the model can be improved. The energies shown above generally show that water molecules are almost as happy when participating in a (cyclic) proton relay as when (passively) solvating the acid. This is probably in part at least because a cyclic proton transfer relay cross-polarises adjacent waters, increasing their own hydrogen bond strengths. Nevertheless, with four water molecules, the possible arrangements in the table above are all in fact quite similar in energy, suggesting that the actual system is a complex dynamic one involving many states of similar energy. A proper molecular-dynamics based sampling of these and other states is probably needed to construct the most realistic model. The extended four-water model results in a lowering of the predicted barrier by ~9-10 kcal/mol to become a more reasonable value for a thermal reaction, perhaps appropriate for catalysis by a relatively weak acid such as acetic. The improvement in part may be because the linear requirement for an Sn2 displacement is more easily accommodated by the larger rings created by using more water molecules. IRC 2, a dip in the gradient norm reveal a hidden intermediate corresponding to the first proton transfer to the oxygen of the acetal. IRC -3 to -4 the third and fourth proton transfers occur, showing that they are sequential rather than synchronous. This examples shows how modelling using transition state theory can yield reasonably realistic answers, but also that the next step in computational modelling, reaction dynamics, is probably needed to properly explore the statistical aspects of mechanism. This entry was posted on Wednesday, November 18th, 2015 at 8:13 pm and is filed under reaction mechanism. You can follow any responses to this entry through the RSS 2.0 feed. You can leave a response, or trackback from your own site.